Dual-wielding pistols while sliding down a bannister. The only thing that screams John Woo more than this are the dive shots. 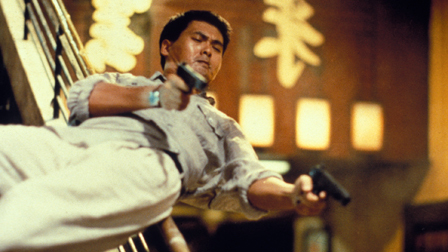 Hong Kong police officer “Tequila” Yuen’s (Chow Yun-Fat) partner gets killed while they attempt to raid an arms deal in a tea house. Having failed to nab the head honcho in the midst of this, Tequila wants revenge is willing to do just about anything to get it. Things get complicated when he encounters the mysterious Alan (Tony Leung). Hard Boiled (辣手神探, Làshǒu shéntàn) is the movie most people probably think of when they think of Hong Kong action movie director John Woo. Interestingly enough, Hard Boiled did far better in American box offices than it did in Hong Kong. Hard Boiled eschews conventional storytelling techniques while featuring every John Woo set piece you can think of. Within the first 10 minutes of the movie, you see Tequila fighting it out with Triad gun runners in the tea house. The gun runners just shoot at anything in front of them, be it innocent bystander, cop, or anything else. I don’t even want to think about the property damage done. Guns appear to have infinitely large magazines as nobody ever needs to reload. Tequila dives while dual-wielding Chinese TT-33 Tokarevs. He chases a gangster down a flight of stairs, gets shot at, almost falls over the bannister, and corrects himself to slide down the bannister while firing the same pistols. In the meantime, you don’t really know the backstory of any of the characters until after this shootout resolves itself. Tequila is shown to be a hard boiled cop (hence the title) cut from very much the same fabric as Dirty Harry who is frequently at odds with his section chief while romancing girlfriend Teresa (the very pretty Teresa Mo). That said, the storytelling in Hard Boiled was a little problematic. Overall, as you can expect from an action movie like this, the plot was paper thin with its usual cast of film noir characters. To me, it seemed like Tequila was consistently significantly more intelligent than any other character. An instance of this is how he could pick out the library book that contained the murder weapon used by Alan earlier when there were no clues to really point to it. Let’s not even go into how a man gets his throat slashed, leaving a bloody mess, in the middle of a hospital and only Tequila could figure out something was amiss when seeing the aftermath. Aside from that latter scene, it seemed like Tequila could always figure things out seemingly without clues, and thus somehow always managed to be at the right place at the right time. Nonetheless, this is exactly the kind of movie people don’t watch for the story. Hard Boiled had some of the best filmed action sequences I have ever seen. The climactic shootout in the hospital is what the movie is known for, and I can see why. The entire hospital sequence, like the rest of the movie, defied any and all sense of logic, and I admire Woo for defying said logic in a way that ultimately proved very appealing. Hard Boiled is a good way to spend an evening with friends while passing around some tequila to drink.